A serene, little (nameless) treehouse, that you can book on Airbnb, is just the place for a weekend of relaxation and romance, we think! This weekend, live it up at a cosy, little treehouse, not far from the city. 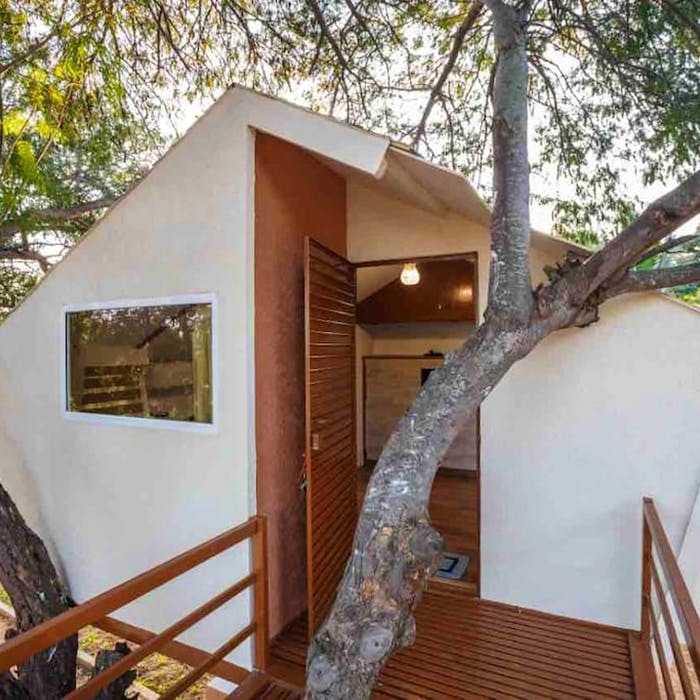 A lovely yet nameless property that can be accessed from the Sarjapur-Attibele Road, this treehouse is owned by an architect and is an Airbnb favourite. The place nestled amidst, well, trees is perfect for a romantic weekend with that special someone or if you are looking to get away from it all, you can head there alone for a few days of rest and relaxation. The treehouse itself is minimally decorated. And all you get for around INR 2,500 a night is a comfy bed, a compact living room where you can chill out, and a small sit out that can be the scene of a romantic, dinner date. Air-conditioning, Wifi and a TV are the modern-day perks on offer here. Hop off your treehouse and you can sign up for a game on the badminton court or you could catch a snooze in a hammock. You can also explore the garden around that comes studded with fruit trees. The treehouse is equipped with a kitchenette so make sure you carry a bag full of groceries and be prepared to put your cooking skills to use because the property does not have food on offer. If you insist on eating out, then, you’ll have to drive back into town.